Albert Rothstein (known by the aliases Nuklon and Atom Smasher) is a fictional superhero in the DC Comics universe. Atom Smasher is known for his power of growth and super strength. Growth, increased strength, stamina, speed and durability. Formerly density control. Atom Smasher made his live appearance on the second season of The Flash played by Adam Copeland. Created by Roy Thomas and Jerry Ordway, he first appeared in All-Star Squadron #25 (September 1983). Thomas chose his name as a tribute to his friend and fellow comic book fan Allan Rothstein. The godson of Al Pratt, the Golden Age Atom, Albert Rothstein acquired his metahuman powers of super strength and control over his molecular structure, allowing him to alter the size and density of his body, from his grandfather, a reluctant supervillain known as Cyclotron. This allowed him to fight crime first as Nuklon, and then, later, as Atom Smasher. As Nuklon, Albert was a charter member of Infinity, Inc. and subsequently served in the Justice League. He was considered a dependable, but rather insecure and indecisive superhero while in Infinity, Inc. During this time he had a mohawk haircut. While in the JLA, he forged a strong friendship with fellow former Infinity Inc. teammate Obsidian. Atom Smasher about to crush Kobra. Albert finally gets his dream and is invited to join the reunited JSA under his new name and identity, Atom Smasher (he mocks his old mohawk and costume in the meantime). For years, Atom Smasher cherishes his role in upholding Pratt's legacy and constantly seeks to prove himself worthy to his Golden Age idols – especially when many of them became his teammates in the JSA. He looks up to the elder JSA members, but is himself looked up to by young rookie member Stargirl. When Albert's mother is murdered in a plane crash engineered by the terrorist Kobra, he becomes consumed by vengeance, nearly crushing Kobra in his hands before he is talked down by his teammate Jack Knight, who convinces him that he should not taint the memory of his mother by associating it with Kobra's murder. Not long after the fatal crash, Albert – with the aid of Metron of the New Gods – goes back in time and replaces his mother with the weakened villain Extant. This ends up saving her life but makes Albert a murderer, even if there was no other way to contain Extant and to stop him from causing further harm. When Captain Marvel's longtime adversary Black Adam reforms and joins the JSA, he and Rothstein develop a rivalry at first as Al refuses to believe Adam has reformed. This soon turns to kinship after Adam justifies Al's murderous actions towards Extant. Indeed, Black Adam comments that he thinks of Atom Smasher as the brother he never had. Encouraged by Adam, Atom Smasher grows frustrated with the JSA's moral boundaries, especially when Kobra blackmails authorities into granting his release. Albert and Adam promptly quit the JSA after Kobra's escape. Shortly thereafter, the unlikely duo settle each other's personal scores. Adam kills Kobra, while Rothstein kills the dictatorial president of Khandaq, Adam's home country. Atom Smasher helps lead a team of rogue metahumans (including former Infinity Inc. teammates Brainwave and Northwind) in an invasion of Khandaq and overthrow its oppressive regime. Atom Smasher initially fights against his JSA teammates in Khandaq before deciding instead to help forge an uneasy truce—Black Adam and his compatriots can remain in power so long as they never leave the country. 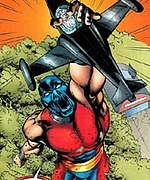 Atom Smasher remains in the Middle Eastern nation for a time, although he eventually begins to question Adam's motives. Rothstein perishes in JSA #75 while fighting against the Spectre, but is revived by Black Adam's lightning, and carried back to JSA headquarters. He is later put on trial for his actions in Khandaq and pleads guilty to all charges. Teammate Stargirl promises to "be there for him" when he gets out. Whilst in jail, he is approached by the founder of the Suicide Squad, Amanda Waller. In 52, he is seen assembling a new Suicide Squad under Waller's orders, instructed to fight Black Adam, and, unbeknownst to Atom Smasher himself, push his family to overreact. They succeed, and Osiris is disgraced and exposed for having killed a Squad member, as Amanda Waller was filming the events, leading to the downfall of the whole Black Marvel Family, and a murderous rampage of Black Adam, dubbed World War III. He then sides with the Justice Society, trying to apprehend Black Adam, but refuses to condemn him in any way, not even believing him guilty of the genocide in Bialya ("Tell me it wasn't you..."). When Adam is robbed of his powers by Captain Marvel, and is about to plunge to his death, it is Atom Smasher who saves him, though no character ever sees this, and Al keeps it hidden. In the Black Adam: The Dark Age series, Albert is shown searching for his former friend, who is intent upon resurrecting his dead wife Isis. In Black Adam #5, Albert brings Adam a bone from Isis' remains (unbeknownst to the JSA, with whom he was searching for Adam), and tries unsuccessfully to persuade his friend to go into hiding. In the Justice Society of America: The Kingdom special, Stargirl recruits Atom Smasher to knock some sense into Damage, who has become an evangelist of sorts for the Third World god Gog after the cosmic being (temporarily) healed his scarred face. He views Pratt's son as a brother figure, since he was brought up by Pratt in the first place. Atom Smasher finally returns to the JSA during the "Black Adam and Isis" arc printed in Justice Society of America #23–25. Asking the team for a second chance at honoring the memory of Al Pratt, Atom Smasher joins the Justice Society in battling Black Adam and Isis, who have robbed Captain Marvel of his powers and his throne at the Rock of Eternity. 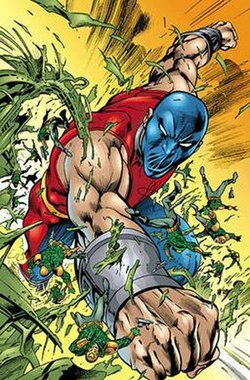 At the conclusion of the story, despite Wildcat's distrust, Atom Smasher is readmitted into the JSA as a full member, along with all the other members of the team who had acted poorly in recent issues. He vanishes for several issues, but he reappears in the JSA: All-Stars book as a victim of kidnapping. Albert has had complicated relationships with women during his tenure on various super-hero teams. While on Infinity, Inc., he was shown to be clearly in love with teammate Fury, despite her engagement to his friend Silver Scarab. Many other characters make note of this, though none of them begrudge Al, and actually feel sorry for him because he will inevitably have his heart broken. Looking up to her even as children, he eventually proposes when Hector is killed and she is left pregnant, so that she will not be alone. She turns him down, saying that she prefers them to be friends. He also has a brief flirtation with the second Wildcat Yolanda Montez, but things never developed between them. During his time with the League, he dates Fire, but he discontinues the relationship because she is not Jewish — even though this did not stop his earlier or later crushes. His relationship with Stargirl is even more complex. While Stargirl has shown some romantic feelings for Atom Smasher in the past, there is never any reciprocation on his part. Later issues clearly establish Stargirl's true feelings, as various friends (such as Billy Batson (Captain Marvel) or her friend Mary) accuse her of liking Al, and she promises to wait for him upon his return from prison. When Al is killed temporarily by The Spectre, she reveals the depths of her feelings for him, weeping over his dead body. Albert finally acknowledges his own feelings when he rejoins the JSA to fight Black Adam, admitting that Billy Batson deserves her far more than Al himself does, in a regretful tone. Al's teammates realize the couple's mutual attraction once they start openly fawning over each other in public, and while Power Girl is supportive ("Go rescue your fair maiden"), the elder members force Al to turn Courtney down due to the age difference. This leaves Al melancholy, and Courtney runs off crying. Later issues of JSA: All-Stars reveal the two still love each other, but after Johnny Sorrow mimics Al to force a kiss from the young girl, they both recognize the need for "space". In Injustice: Gods Among Us, Year 5 Annual, (Injustice is outside of the regular DC universe continuity) he's revealed to be in a relationship with Giganta, but they both frequently argue and bicker, leading to them getting into huge fights. According to Yellow Lantern, they argue and bicker a lot, but they always end up making up. While cleaning up Metropolis, the 2 of them argue over a metal girder and start fighting, trashing half of the city. Already super strong at his normal size — 7 ft 6 in, or 2.3 m — (though recently he has been depicted as being of a more normal height when not using his powers), Atom Smasher's strength and density increase proportionately to whatever size he chooses (it was explained in JSA #75 that his muscles and bones actually break and reform as they grow in order to achieve these great heights). In the DC Encyclopedia, it is stated that he could grow up to 60 feet without problems. Whether there is a limit to the heights he can grow to is unknown. At 60 feet, he was strong enough to knock out Power Girl with one stomp, and easily decimated most of the JSA during "Black Reign", but he is vulnerable to super-strong punches from the likes of Black Adam, being knocked unconscious with one blow several times. During his time as Nuklon, Albert was able to phase through walls; he has not been shown using this power in recent years, but it is unclear whether it has been retconned away. Rothstein is also a skilled pilot and mechanic. In the first few years of JSA, he could be seen piloting the JSA's jet, the Steel Eagle, as well as the Star Rocket Racer in JSA: Our Worlds at War, and earlier being Infinity, Inc.'s primary pilot. Al was part of Superman's Justice League in Mark Waid and Alex Ross' Kingdom Come under the code-name "Atom Smasher". This was the debut of his new name, which was later used in mainstream DC continuity. In Justice League episode "Legends" a character named Tom Turbine voiced by Ted McGinley is based on Atom Smasher and Superman. Tom Turbine, was an alternate-Earth superhero and a member of the Justice Guild of America (based in Justice Society of America). During his time as a superhero, Tom Turbine battled the Injustice Guild. He died along with the rest of the JGA during a war that destroyed most of their world. He, along with the rest of the Justice Guild, "died" a second time defeating Ray Thompson, who had recreated them all, in an illusion of his past world. According to Bruce Timm, Tom Turbine was based primarily on the Golden Age Atom, Albert Pratt. Several characteristics of early Superman were incorporated into the character as well. Atom Smasher in Justice League Unlimited in the episode "Task Force X". 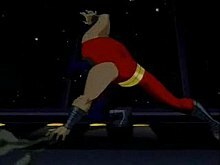 Atom Smasher appears in the DC animated universe series Justice League Unlimited, voiced by an uncredited Kevin Conroy. He appears as a member of the expanded Justice League. In "Dark Heart," Atom Smasher helps the Justice League fight the aliens spawned from the Dark Heart. In "Task Force X," Atom Smasher fights the Annihilator while Shining Knight and Vigilante fight Task Force X. Atom Smasher is quickly defeated. As Martian Manhunter battles the team, Plastique forces him to stop when she threatens to place a bomb in Atom Smasher's mouth; however Captain Atom arrives and stops her. In "Panic In The Sky", Atom Smasher is shown fighting a Long Shadow clone and defeating it. On the television series The Flash, in the episode "Power Outage", Al Rothstein is mentioned as one of the people who seemingly died as a result of the particle accelerator accident that gave The Flash his powers. For the second season Adam Copeland was cast as Atom Smasher, debuting in the first episode "The Man Who Saved Central City". This Albert Rothstein is implied to be a metahuman from Earth-2. For some reason he kills his counterpart in this universe, who, contradictory to "Power Outage," did not die in the accident and was in fact in Hawaii at the time. With this version he is portrayed as a villain, who comes to Central City to kill the Flash at Zoom's request. Gaining his powers by absorbing radiation in his vicinity, he is defeated when the Flash lures him into a nuclear reactor and exposes him to a lethal dose, Rothstein being unable to absorb all that energy. A dying Rothstein tells Flash that the person promised to take him home if he successfully defeated the Flash went by the name Zoom. Atom Smasher is set to appear in the upcoming Black Adam. Atom Smasher makes a cameo appearance in Injustice: Gods Among Us. He is seen at the outdoors area of the Hall of Justice stage, fighting Giganta in the background. When a hero or villain transitions to the next part of the stage, the character is flung by a robot into Giganta's hand and she punches Atom Smasher with the character before it is flung into the Hall of Justice (Great Hall). Atom Smasher was rendered as an action figure for Mattel's Justice League Unlimited toyline in the summer of 2005. In February 2009, Atom Smasher was the Collect-and-Connect figure of the seventh wave of the DC Universe Classics line. ^ a b c Jimenez, Phil (2008). "Atom-Smasher". In Dougall, Alastair (ed.). The DC Comics Encyclopedia. London: Dorling Kindersley. p. 31. ISBN 0-7566-4119-5. ^ Manning, Matthew K. (2010). "1980s". In Dolan, Hannah (ed.). DC Comics Year By Year A Visual Chronicle. Dorling Kindersley. p. 203. ISBN 978-0-7566-6742-9. The children of the original Justice Society of America made their smash debut in this issue by writer Roy Thomas and penciler Jerry Ordway...All-Star Squadron #25 marked the first appearances of future cult-favorite heroes Jade, Obsidian, Fury, Brainwave Jr., the Silver Scarab, Northwind, and Nuklon. ^ Thomas, Roy; Jerry Ordway (Spring 1999). "Two Co-Creators Reveal--The Secret Origins of Infinity, Inc". Alter Ego. Two Morrows Publishing. 3 (1). Retrieved 2008-04-20. ^ Russ Burlingame (2015-07-16). "EXCLUSIVE: WWE's Adam "Edge" Copeland Cast As Atom-Smasher On The Flash Season 2". Comicbook.com. Retrieved 2015-07-16. ^ "INJUSTICE GODS AMONG US Videos Reveal DC Easter Eggs". Newsarama.com. Retrieved 2015-05-23.